Properties in Bouches-du-Rhône average 4.6 out of 5 stars. Provencal farmhouse located in the Regional Park of the Alpilles. Property 16: Provencal farmhouse located in the Regional Park of the Alpilles. Cassis, T3 apartment in the heart of the village. Port, beaches and creeks on foot. 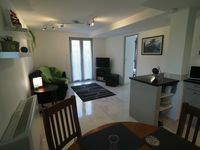 Property 27: Cassis, T3 apartment in the heart of the village. Port, beaches and creeks on foot. House in Camargue, Garden, Parking, 2 minutes from the beach, Up to 3 animals. Property 37: House in Camargue, Garden, Parking, 2 minutes from the beach, Up to 3 animals. NEW: In the heart of the city center of St Rémy de Provence, the Mas d'Oscar! Property 39: NEW: In the heart of the city center of St Rémy de Provence, the Mas d'Oscar! House in the Camargue. Private parking, wifi. House of Camargue classified 3 stars. Property 40: House in the Camargue. Private parking, wifi. 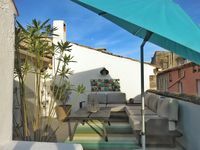 House of Camargue classified 3 stars. Just completed a three week stay at La Gar&ccedil;onni&egrave;re and I can&rsquo;t say enough good things about it. The apartment is charming and filled with personality and art. The kitchen is well equipped and had everything we needed to warm up prepared foods purchased locally. I highly recommend Pasta Nostra on Rue de Republicque, a 5 minute walk at most. They have fresh pasta and prepared Italian delicacies as well as local wine and oils. The owners are delightful. One of the best meals I had was at Bravo&rsquo;s . Don&rsquo;t be fooled by the street signage, it is much more than pizza. I had the best steak frites, wine and salad there one night. Also Fratelli&rsquo;s is great food and lively service. The apartment is lovely, peaceful and the outdoor patio is a treat. I played light jazz on the sound system upstairs while I prepared my breakfast most mornings- thank you Thierry and Jean-Paul for your wonderful selection of music. The SMART TV was wonderful and I logged on to my Netflix account and watched many of my favorite shows that way. I did laundry in the upstairs washer/dryer and used the drying rack for most everything except towels. Delphine works full time but was helpful and just a wonderful and lovely person who lives locally. Thierry answered all my questions quickly and respectfully. I treated this lovely home as if it were my own...cleaning, tidying and being respectful of lights and heat every day!! I hated to leave and get back to work! Many thanks for allowing me this opportunity to experience Provence like a local. the apartment is completely new and with all necessary amenities including parking (which is a huge plus in Aix), providing a maximum comfort level, even for long stays (i stayed two months). the owner is very nice and helpful with any question, even where to buy a good baguette! in short - highly recommended.